This is an article I initialy wrote for my company blog. After several surveys, it appears that the main cause of project failure is the lack of project management methodology. 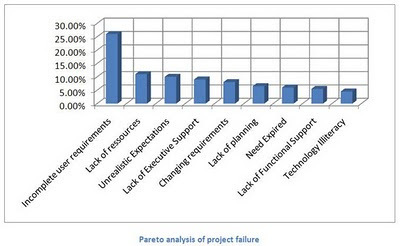 Presented in the form of a Pareto chart, here are the main causes of project failure. The purpose of the Pareto chart is to highlight the most important among a set of factors. In quality control, it often represents the most common sources of defects, the highest occurring type of defect, or the most frequent reasons for customer complaints. Reading this results show us that the most important phase in project management are “Initiating” and “Planning” phases. In the past we believed that project management would require more people and increase the overall cost in the organization. Today we know that project management allows us to accomplish more work in less time with fewer people and without any sacrifice to quality. We also believed that only big project requires project management. Today we know that all projects will benefit from project management (maybe not the entire methodology for smaller projects…). There is no “one best project management methodology”. Each company should build its own methodology based on their business and their maturity in project management. On the market today there is, among others, two methodologies, PRINCE2® and PMBOK® from the Project Management Institute. Today, the definition of success is: providing value to customer inside the triple constraint of Scope, Time, and Cost (Quality can also be considered within it). Project Management methodology is just a tool that will help you on this way. PM has been overlooked even though it’s very significant in large-scale projects. However, that is starting to change because of the prominence of cloud computing-based project management software. This allows teams to have a centralized information system, which enables them to communicate better and meet expected goals on time. Hi Wilber, fully agree with you, even if cloud based or not is not the key question, accessing data is the point. - 12 years' experience in project planning/scheduling and management of large IS/IT projects for multi-national companies. - A major player in defining tailor-made methodologies for project, program or operation management. © Jeremy Cottino 2018 . Powered by Blogger .